The Clarity PHEV is a fantastic choice for anyone who wants an electric vehicle, but who also needs the flexibility of being able to take long trips when needed. A plug-in vehicle without compromise? I bought my 2018 Honda Clarity Plug-In Hybrid in February 2018 (just over five months ago as I write this), and I have already racked up over 10k miles on my odometer. I drive a lot. 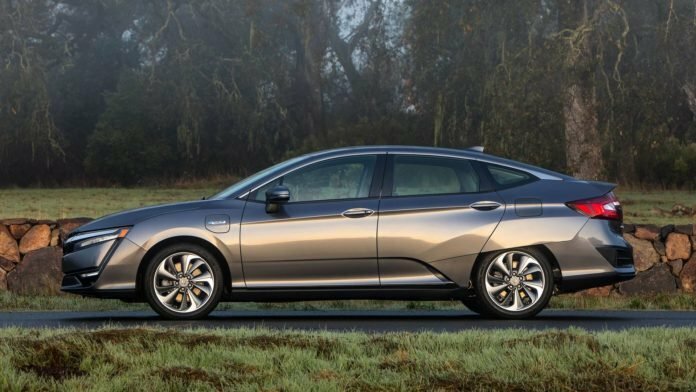 To jump right in, why did I buy a new car in the first place – and why a Honda Clarity PHEV? Towards the end of my previous car’s time with me, it leaked ~0.5 L of oil per week. So, clearly, it was pretty much kaput. Thus began my shockingly short search for a new vehicle. I knew that I wanted something that would be fuel efficient and reliable, preferably with some electric range. My dream car is a Tesla Model 3, but given how unreliable my current car had become, I wasn’t exactly able to wait on the long list of people in line for one. From the moment I saw the car, I was intrigued. I’m used to the overtly futuristic look of other mainstream hybrids (I’m looking at you, Prius), and though Honda has definitely made some aesthetically divisive design decisions, the Clarity has a significantly lower shock-factor than the Prius. 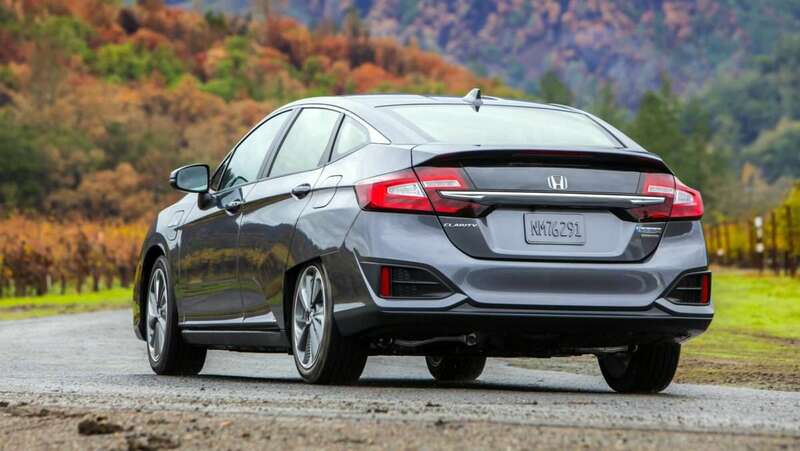 The most notable design choice is the shrouded rear tires, which help the Clarity slip through the air more effortlessly. Largely, the exterior of the Clarity fits in quite nicely with the design of newer Honda Accords and Civics. As an interesting note, a couple of reviews I’ve come across online have referred to the Clarity as the ugliest car of the year, which I rather enjoy. This is in pretty stark contrast to all the times I’ve been stopped at my local car chargers by strangers who wanted to know more about EVs and my car in particular, all of them raving about how nice of a car it is. So, “divisive” is probably an appropriate way to describe the design of the Clarity. Sitting in the car, it feels wonderfully familiar to the “conventional” vehicles I’ve driven all my life (except this time, the car isn’t as old as I am . . . ). The two notable differences inside the vehicle are the paddle selectors on the steering column (used to control the strength of its regenerative braking) and the gear selector – which is a row of push (and pull) buttons in lieu of a lever. The interior of the car is comfortable and shockingly roomy. The gear selector is suspended on a bridge, which allows for a shelf underneath that houses two USB charging ports (one provides 1.5A and the other provides 1.0A) as well as the standard power socket that most cars have (there is a second power socket behind the center console for rear passengers). This shelf has become a fantastic place for my wallet, phone, and notebook during my daily commute. The car comes in two trims: Base and Touring. The Touring trim only adds a few features, such as Honda Satellite Navigation (though Android Auto and Apple CarPlay are available in the Base trim as well), full-leather seats, a leather-wrapped steering wheel, and power seats (with settings memorized based on key fob). Critically, there are no performance differences between the trims – the electric range, fuel economy, safety features, and engine/motor power of the two trims are identical. I’ll admit that I was slightly perturbed by the process of turning the car on. Hitting the Start button results in the dash and touchscreen lighting up as well as a quiet boot-up sound, which I suspect was added to satisfy the part of my brain that expects to hear the engine turning over. While I have since come to appreciate this sound, all I could hear was a deafening silence when I turned the car on for the first time. Like a 90’s sitcom, I looked over to the salesman in the passenger seat with (what I assume was) a look of naïve stupor on my face and asked him if the car had turned on or not . . . it had, of course. Having never driven a hybrid or electric vehicle before, I honestly wasn’t sure what to expect. Would it be lethargic like I’d expect from stories I’ve heard about hybrids, or would it be zippy like I’d expect from stories I’ve heard about EVs? To my delight, the car proved to be pretty zippy! While the Clarity won’t push you back in your seat like a Tesla S will, it provides more than ample acceleration if you need it. Its Sport Mode significantly increases the responsiveness of the accelerator and, quite frankly, makes the Clarity an exciting vehicle to drive. I was also pleasantly surprised by the paddle selectors for the regenerative braking. I found that the process of using them became second-nature very quickly and by the end of my short test drive I was using them without much active thought, which I consider to be a big win. One of the qualities I care most about in a vehicle is visibility while driving, and this is a place where the Clarity excels (maybe that’s where the name comes from . . . ). While the rear window isn’t very big, the Clarity has a window through the trunk that adds a very valuable visibility patch. The last major thing I noticed during my first test drive is the steering wheel itself. It may sound silly, but the steering wheel just feels solid. It has very little play in it and I find that it provides a really comforting feeling of confidence while driving that is hard to explain. It adds a sense of intentionality to any input when driving that I adore. How do these stats stack up with reality? Short answer: shockingly well, actually! In the 10k miles I’ve put on my car, I’ve averaged ~55 miles on every full charge of my car and nearly 50 mpg when driving in hybrid mode (something like 18% better than the stated values). It’s worth noting that most of my hybrid-mode driving is highway driving with only a little smattering of city driving – I manage to drive in electric mode upwards of 90% of the time. Of course, these differences are certainly, in part, due to my tendency to be a mild-mannered driver (apart from the occasional passive-aggressive mutterings under my breath about the inability of Baton Rouge citizens to merge properly). As far as horsepower is concerned, I admit to lacking the ability to intuit horsepower by feel, but the car certainly seems to have the get-up-and-go that I ask of it when merging. Despite weighing in at just over 4000 lbs, the Clarity still manages to deliver a 0-60 time of around 7.5s, which is pretty solid for a hybrid with such a beefy battery. As anyone who has driven an electric car will tell you: they’re exciting. Regardless of the 0-60 time, the instant torque and responsiveness of any electric vehicle is simply delightful. In the Clarity, this fact is compounded with a decent 0-60 coupled with a very sensitive accelerator when the car is in Sport Mode that makes driving almost dangerously fun. If the accelerator is pushed far enough, the car seamlessly kicks the gasoline engine on to provide the requested power, which is really easy to do in Sport Mode – a fact that leads me to keep the car in Eco Mode. The Clarity’s no McLaren (I had a little chuckle to myself when I parked next to a McLaren yesterday and noted the fact that the two cars could not be more different from each other), but it still manages to elicit joy in my daily commute. Remote Climate Control is a wonderful feature to have here in the oven that is Louisiana. The engine bay is significantly more roomy and accessible than most other hybrids I’ve seen, which is a huge boon for someone who likes to do his own car work and maintenance. As many other reviewers/owners have mentioned, this car practically begs to be driven as an EV (it even has the tailpipe tucked away out of sight), despite managing to be rather adept at eking out a high degree of efficiency from burning gasoline. The Clarity is so quiet that I hear other vehicles creeping up on me when driving, which quite literally adds a new dimension to my road awareness. It’s nearly impossible to hear or notice the gasoline engine kicking on, except for when driving at low speeds. The Clarity also makes an artificial exterior noise to alert pedestrians of its presence when driving at low speeds. While it’s not a Clarity exclusive, the reverse camera is such a wonderful feature that I feel obligated to mention it. I’m almost surprised that reverse cameras haven’t become required by law at this point. The auto-dimming rear view mirror is wonderful. While some people prefer blind-spot monitoring, I think the addition of “Lane-Watch” (a camera on the passenger-side mirror that provides a wide-angle view of the passenger-side blind spot) is a fantastic feature. The car has a brake-hold system that can be toggled to keep the car stopped without your foot on the brakes – even on a hill. The Clarity has an Adaptive Cruise Control (ACC) that will maintain a set distance from the car in front while cruising (traditional Cruise Control can be toggled easily, if desired). I was really shocked at how well it maintains distance, and the ACC will keep distance at speeds below 25 mph, as well (this feature is referred to as Low-Speed Follow). The car has a Lane Keeping Assist System (LKAS) as well that attempts to keep the car centered in its lane. While LKAS works reasonably well in highway conditions, it tends to get confused by merge lanes and off/on ramps. Generally, it’s a nice system, but it’s important to learn when it doesn’t work properly. 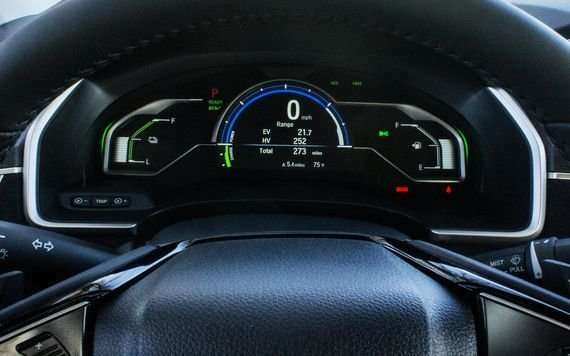 The Clarity had some software problems upon release with estimating hybrid-mode range. It would drastically over-estimate hybrid range if a significant amount of electric driving was done (it essentially averaged the fuel economy between gas fill-ups, but included electric driving in the calculation). This was recently fixed in a software update, and now the range estimates are wonderfully accurate. The Clarity doesn’t provide Wh/mi data like some other EVs, which is pretty disappointing. It also doesn’t tell you the state-of-charge of the battery in kWh, another small disappointment. As someone who tracks fuel economy religiously, I find this to be a constant, mild annoyance. All in all, I think the Clarity PHEV is a fantastic choice for anyone who wants an electric vehicle, but who also needs the flexibility of being able to take long trips when needed. The 47-mile electric range (which, in the realm of PHEVs, is second only to the 2018 Volt’s 53-mile range) is enough to cover most, if not all of the average daily commute. 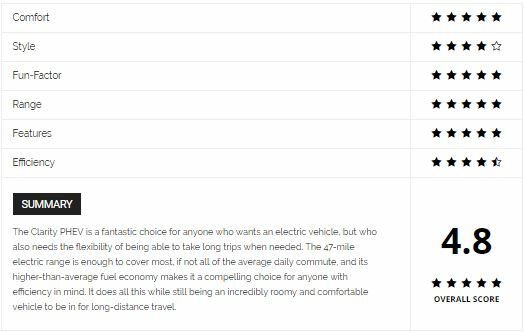 This, coupled with its higher-than-average fuel economy (42 mpg combined) makes it a compelling choice for anyone with efficiency in mind – and it does all this while still being an incredibly roomy and comfortable vehicle to be in for long-distance travel! At the end of the day, I love my Clarity PHEV and feel that it truly is a plug-in vehicle without the compromise.